Firstly, sorry i haven’t been around in either writing reviews or crafty/random posts. If anything i am now finally in a small routine with work but a lot of the time i just want to chill and catch up with house work on my days off. That being said, i did ensure that October was not overly crammed with books to read as i knew i had three to read and review on set times. This review is a few days late, an i am thankful for Marion Mavis in understanding my reason for delay! – So, expect the next few book reviews over the course of the up and coming weeks to be arcs AND the odd random. I just want to spend more time concentrating on reading the books i need to review, as i like to make notes along the way etc – I feel i owe the authors my attention for allowing me to read their book for free! I am also trying to stick to a writing schedule, and i have lot’s of stuff prepping, planning, writing to which more will revealed in December. I am planning a catch up post soon, so keep a look out for a chit chat or it more than likely will be a YT video. So let’s get on with this review?! Firstly, i want to shout out to the beautiful cover. It really sets the tone for the book, especially with the shade purple. It gives me warm witchy vibes. Being exiled from her coven is the least of Evelyn’s problems. Although only passed her sixteenth summer, Evelyn is considered to be one of the most powerful witches in the entire realm. With her magic comes the honour of being chosen as the next coven leader. Unfortunately one unlawful use of magic costs her the life she always dreamed of. But perhaps leaving her sheltered life behind was the best thing for her. As she sees the world of witches in a new light, she learns more about her own magic. Powers that go behind those of even a Supremacy witch. Evelyn is a clairvoyant, a gift not many have come to possess. I LOVED this book. I have been so excited to write a review about it. I don’t read a lot of witchy fantasy books, i did a long time back but i always found a trend with them being similar and repetitive. However, this was a burst of fresh air. 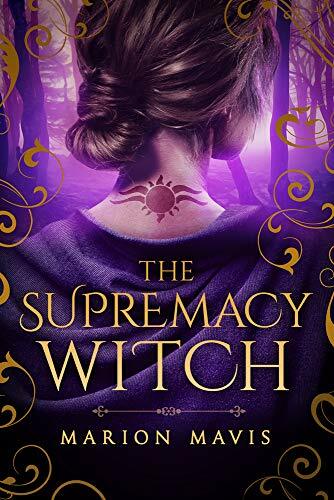 Marion is an excellent writer and the world she created is fascinating, the way she set the tone allowed me to easily vision the world of witches and magic the story was about. Where do i start? I get so hyped. Okay. It’s written in third, which for me worked well. Lot’s of characters appeared in this book and it switched from time to time to their POV. Which i really REALLY enjoyed. Especially because of the huge magical world, lots of things to learn about the witches history, coven’s and magic. Marion had plotted and thought this out well. This is a fast paced book, which for some people can find issues with and others love. I loved the pace, it worked with the premise. Especially as it is book one, it left me turning the pages and needing to know more, i needed to know where or what the characters were doing. Which leaves me with.. I WANT TO READ THE SECOND BOOK. I was not bored at all and the author never EVER dragged out a scene. Her writing was descriptive, and each scene left you with the right amount of information should we need to know anything. The action, the magic, i am in awe. I want merch.. I WANT POSTERS. I want this to be a TV show. I am not lying i loved it that much i could actually cry. The characters. Firstly, Evelyn is amazing. She is the main character, the witch who i guess is the chosen one. I often find when i read books and it’s in first POV i hate the main character but because this was in third, i felt i connect more with Evelyn which is odd seeing as first is supposed to do that but Marion is such a fantastic writer that i really did feel everything Evelyn felt. Her anger, sadness, her anger when lied to and left by her friends. I am rooting for her in the next book, and can i just say that i STAN for her and Mavrik. I liked Evelyn because she had a sense of being lost and finally connected with something which is deemed bad. She also doesn’t want to follow the rules and be like everyone else. Amelia i had issues with. I hope she gets captured or killed off, ouch i know. She is the reason this book is not five stars. Her hypocrisy, how she called out Jackson for his jealousy yet it came across as though she was deep down jealous of Evelyn? Especially as she easily turned her back on her with the dark magic. Amelia all of a sudden became so self righteous i wanted to punch her. When she began to feel guilty, i didn’t feel sorry for her because she is an idiot and it really just show her true character. This is not the authors fault as i am so sure she intended on this with Amelia. Jackson needed more time, i like him. I really do even though he is blinded by love, but i want to hear more from him than Amelia in the next book. He could be very very helpful given the gift he has. Robin an Flora, i hope they return. Mavrik – My favourite, i love him! He often out shone Evelyn for me at times (no shade) and i think it’s because of him being a dark witch. His coven fascinated me and so did his mother. Anyways – Read this book. It was so much fun and interesting that i just kept reading and reading and reading. Marion has created a beautiful world, likeable characters and a complete roller coaster ride of a story. The last five chapters were perfect, especially the end, it opened SO many doors for her and her friends, and even characters that were not that big as it gave us readers opportunity to see that this world is so much bigger than we just read and lots more interesting things are to happen! Agree that is a lovely cover.